On Tuesday it appears the Blackhawks won’t be bringing forward Dennis Rasmussen back after all. Despite reports that the Hawks had extended a qualifying offer to Rasmussen, it now appears the organization will let him become an unrestricted free agent on July 1. The Blackhawks did not protect Rasmussen in the expansion draft, a move that was a bit of a surprise to some. Rasmussen, who turns 27 on July 3, played on a $575k cap hit last season. 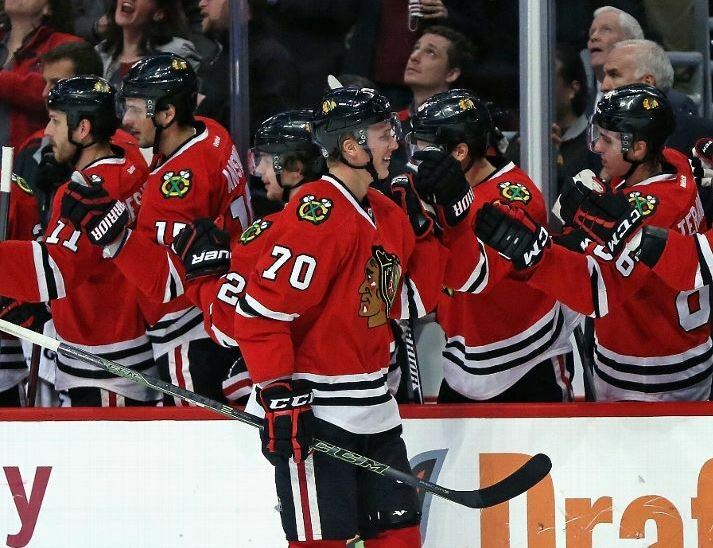 He had eight goals and nine assists in 112 regular season appearances for Chicago over the last two seasons. The Blackhawks originally signed Rasmussen as a free agent on June 10, 2014. “Poor man’s Marcus Kruger” will apparently stay poor. “…Rasmussen was promptly benched for seven of eight games — after playing in 45 of 47 leading up to that point”. And just when we thought the old Bob Pulford/Bill Wirtz days were over for good. Nick is going to compare this to Pulford and Wirtz? You serious? Don’t understand the move. But I wonder how much he was looking for. Pretty petty if they benched him because he turned down an extension. Either way he will find a role somewhere in the NHL. Not a star player by any stretch, but He was far better and more valuable than Jurco. He is a big center with a good shot. As I recall, the Hawks weren’t quite as good with him out of the lineup in regards to checking the other teams top lines. Stan’s pipe dream of Jurco being a poor mans Hossa is pretty far fetched, but time will tell. Yeah, Dave, maybe you’re too young to remember how Pully mishandled his players. But Q’s doghouse is daycare compared to Pully’s. I dont buy the benching thing. He played 45 of 47…benched for 7 of 8. So played 46 of 55. And played 22 of the final 27 when everyone was healthy. With expanded rosters. He doesnt hold a candle to Kruger. Had half the production offensively. His skating is an issue. He was 44.6% at the dot. And was 23rd of 27 players in sf%. Kruger was 10th on the Hawks. Kero surprisingly was 24th. Kempny was the highest semi regular in 2nd. Jurco was 3rd in 13 games. Advanced stats dont tell the whole story. But usually when youre putting more shots on net than the opposing team good thungs happen. Nick, not sure benching Rasmussen is equivalent to the Pully days. If moose didn’t want to sign a contract because he thought he could do better in free agency, that’s cool. I will never begrudge a player for trying to get the most value he can get during his playing days. But it’s not like the Hawks don’t have a lot of young players trying to crack the lineup. Let’s not forget that Moose was never drafted by any NHL team and until the Hawks came looking, he was playing overseas. So, it’s not like this is a guy teams were running to sign in the first place… If the Hawks benched him, so what? He basically told the team that he didn’t see himself in their future plans, why waste minutes on a bottom 6 guy who doesn’t want to be here? Dime a dozen type. Very replaceable. Goodbye. Equating this to a Dollar Bill move of days gone by? Beyond idiotic. Uh Nick. I’m 4 months from being 56. I full well know the Pulford days. This doesn’t come close to those days. Thank you, Rufus! Doesn’t come close to the days of even Rocky’s grandfather, who was the one who let #9 go. In the scheme of things, this is a non-issue, petty at best. However, when you compare Rasmussen to Tootoo, then this is a bad move. Assuming one of them is should be on the team, who is more useful, Rasmussen or Tootoo? The mere fact that Tootoo’s name shows up — even at the 13th or 14th forward — on virtually all line projections by both the media and bloggers on this site is a joke. This is on Bowman for re-signing him. One can only hope he ends up in Rockford all year like Mashinter did last season after Bowman re-signed him. Morin or Pirri returning (lol) would be an improvement over Tootoo. Tootoo’s friendship w/ Seabrook and Keith should be limited to the summers, not an additional seven months on the Hawks. Yeah, Rufus, I’ve heard about you — arrogantly demeaning others while hardly impressing subscribers with your HAWKS acumen. Sounds like you were not around when Dollar Bill was doing his thing to Glenn Hall, Jeremy Roenick, Eddie Balfore, and I’m sure there are others. Rasmussen was not my favorite but Dog Houses and Press Boxes are bush league. BTW, I don’t think your ideas are idiotic — just in need of the right audience, like Blues Talk Forum. They’d love your grit. 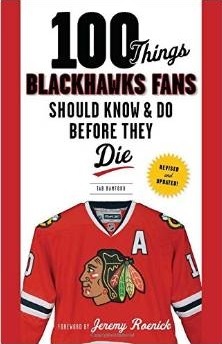 I agree Iceman- Tootoo shouldn’t be allowed in the United Center front door. He is not an NHL player. I am not sorry to see Moose go. Very marginal player. There won’t be any room for the Tootoo/Moose types this year when Fortin and DeBrincat make the team. 1961 – spot on 1000% on all fronts. If a center who is proven/successful at faceoffs is not signed (i.e. Brian Boyle, Brian Boyle, Brian Boyle, who is durable and can kill penalties as well, and actually has some offense to his game as an ancillary bonus), I still maintain Jake Dowell would be better served than Tootoo on the roster. If all Dowell did was take faceoffs, this would benefit the Hawks far more than dressing Tootoo for 40-55 games. Hopefully, 1961 is accurate in his assessment that Fortin & Debrincat both make the team. Tootoo can hang out w/ Dowell in Rockford then. …I see a comparison to the Pulford years in “petty” – he/the organization was that. Bill Wirtz was not in charge of the Hawks in the days of Glen Hall, Nick. At the time of the 1961 Cup, Bruce Norris was owner. And Hall was left unprotected in the 1967 expansion draft. Mr. Hlavaty needs to get his facts straight and do his research better. Well Nick, I’ve been a fan since the mid 70s and a season ticket holder for nearly 3 decades. That said, I could care less your nonsensical rip job that somehow not signing a dime a dozen forwards equates the the days of Bill Wirtz and Bub Pulford spending money frugally. It may just be as simple as the Blackhawks looking at him and thinking his game won’t progress much from what it is now. Sounds like he made this decision a little easier by looking for more money from a cap heavy team. Doesn’t take a ton off of the cap, but it opens up another spot. Like or not its a business and a business decision was just made. Tootoo is a low cap hit and Moose turned down an offer, Jurco took a pay cut and all are maybe players who would you take. I liked Moose always felt he was an underrated player, that being said he is a bottom 6 guy so it’s not a huge loss. This offseason has been very interesting to say the least. Forgot to say cap crunch still on until season starts. Dauphin in picture now too and much faster than Moose. Not a huge loss, I’d rather have Jurco. He has way more potential just hasn’t had a real opportunity to fit in. You gotta give someone about 20 games in the NHL, usually, to see how well they adapt. Jurco has sick hands and could prove to be a surprise to a lot of fans. Chemistry is everything in hockey…look at Panik for example. Things gotta work in and out of the locker room. Also, I’m hoping Fortin shows what he’s got. He looks promising. In addition, Hayden looked very comfortable in the pros starting from his first shift. Kevin put Dauphin with Jurco and Fortin could make a fun line to watch. Why not? Give the guys a chance to gel instead of playing chess with the line up all the time. Side note, I’d even look at picking up Sam Gagner, Boyle, Bonino, maybe even Vrbata for fairly cheap. Gagner and Kane have history. Just my opinion. Yeah I hear ya but wouldn’t be surprised to see a top 4 dman picked up during the season so it would depend on whats available. For sure, guess we’ll see come July 1st. RasMOOSE. Played very well for him and for a really good caphit when we needed someone who could play and only had little cap space. Hes is good as he is and did good when he played here. I like this guy and proud he was on team when we needed a guy who could play. Fortin to Dauphin…not quite on the same level as Danault to Dano. To clarify, im not talking about the on ice product. But those 3 and Tootoo would be a speedy 4th line. As useless as Tootoo is, he can skate. Duringthe draft on3 of the talking heads was talking about a player. Said lots of players can skate fast…but not many have the hands to keep up… made me think of Hinostroza. Id throw Vinnie in the deal to Vegas with Kruger. Back to Tootoo. Remember the Darling article in the players tribune? He talked about meeting another hockey player in rehab. We know Tootoo went to rehab about the same time. Tootoo was in the predators organization…and the admirals are the team that gave darling his break. Regardless, manor stick taps to both for overcoming their demons. Thats why I left Hino out although Dauphin has been described like that at times too those 3 have lot more skill and potential than Tootoo at this stage of the game. “Bill Wirtz was not in charge of the Hawks in the days of Glen Hall, Nick. At the time of the 1961 Cup, Bruce Norris was owner. And Hall was left unprotected in the 1967 expansion draft. Mr. Hlavaty needs to get his facts straight and do his research better.” – DAVE. Norris might have been around for the ’61 Cup, but Wirtz (Arthur and Bill) had sole ownership of the team in 1966. It would seem Arthur (World Class Prick) controlled until 1983…and then, in the hands of Dollar Bill the REAL decline began. The defense will be the great unknown next season. There also is legitimate concern for the 3rd and 4th line. Given this making the playoffs can’t be presumed. It’s definitely a transition season that is upcoming. It will be an interesting journey. We porb cant expect the 1 seed on conference. The young guys arnt in rookie yrs anymore. Only roles to fill are the top 4 D in Hammer and another top 6 FW. We get one or two of those were fine/not guaranteed to make playoffs, if we donot get either by deadline then we might be between 4/5-9 seed. I think we could make playoffs with just the core guys and 6 ahls players like we did in 2011, if we really wanted to. Looks like were building for playoffs style and not a higher seed in regular season records. Always enjoy the historical opinions of guys that actually lived through the eras of yesteryear.